The Transformers franchise, is a globally recognised brand, so when it comes to their products, exceptional quality is a must. 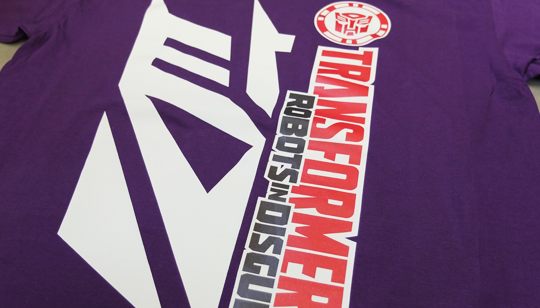 We were assigned the task of producing a number of printed coats and t-shirts for the Transformers franchise, with an extremely tight deadline for a campaign. Through a combination of market leading technology and responsive customer service, we were able to deliver a variety of printed coats and t-shirts, within an extremely tight time frame. To ensure consistency across the products alongside creating the desired finish we used a combination of Digital Transfer & Vinyl printing. This ensured bold prints that would be durable and striking on both the t-shirts and coats.